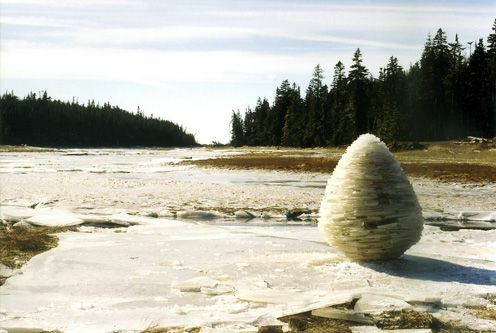 Landscape sculptor Andy Goldsworthy is renowned throughout the world for his work in ice, stone, leaves, wood. His own remarkable still photographs are Goldsworthy’s way of talking about his often ephemeral works, of fixing them in time.. Now with this deeply moving film, shot in four countries and across four seasons, and the first major film he has allowed to be made, the elusive element of time adheres to his sculpture. Director Thomas Riedelsheimer worked with Andy Goldsworthy for over a year to shoot this film. What Riedelsheimer found was a profound sense of breathless discovery and uncertainty in Goldsworthy’s work, in contrast to the stability of conventional sculpture. There is risk in everything that Goldsworthy does. He takes his fragile work – and it can be as fragile in stone as in ice or twigs – right to the edge of its collapse, a very beautiful balance and a very dramatic edge within the film. The film captures the essential unpredictability of working with rivers and with tides, feels into a sense of liquidity in stone, travels with Goldsworthy underneath the skin of the earth and reveals colour and energy flowing through all things. Riedelsheimer’s film, like Goldsworthy’s sculpture, grows into something beyond the simple making of a object. It touches the heart of what Goldsworthy does and who he is, in much the same way that Goldworthy touches the heart of a place when he works in it and leaves his mark on it.In this film, which is Goldworthy’s work as much as Riedelsheimer’s, “you see something you never saw before; that was always there but you were blind to”.